Gunite is complete and we have a transparent/iridescent MasterTile going on infinity edge, spa overflow, and water line. The tile looks splotchy (has dark areas) for some reason. The builder says it is moisture behind the tile that hasn't dried. The problem is it rained today and it got worse so doesn't that mean when there is water in the pool it's always going to look bad? Surely if moisture can get behind there that can't be good? It is over the entire perimeter of the pool. I would be asking exactly WHAT they used behind the tile. 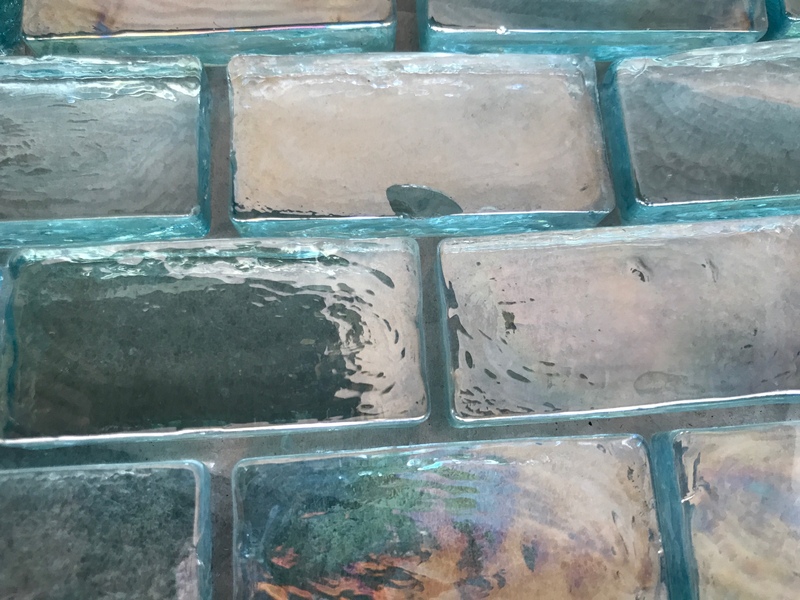 From my own bad personal experience, having your glass tile PROPERLY installed with a moisture barrier in place will keep you from having this issue and efflorescence down the road. I was told they are using acid resistant thin set. What is the moisture barrier composed of?? We just had glass tile installed and they put down a very thick green substance as a water dealer before he tile went down. It looks like moisture back there to me too. It is there because I don't think he got the tiles completely embedded into the thinset and there are air voids back there holding the moisture. How long has the tile been up? Its possible that some areas of thinset haven't fully cured yet. Glass doesn't breath so thinset takes longer to set up. IIRC recomendations are to give it a few days, up to a week to fully cure (setup). Ditto with the mortar or concrete behind the tile, how long has it been drying for? The tell is the dark areas where the sheets meet. That just looks like different areas of thinset drying at different rates. The first pic looks like there's moisture behind the tile. Tile isn't fully set in the thinset so moisture is in the gap behind the tile or, again, the thinset hasn't fully cured. To have moisture in a void behind the tile means they didn't install it (glass tile) right. Your supposed to spread thinset with a notched trowel, then spread it flat, then embed the tiles. It is a known problem when the glass tile is only embedded in knothed thinset and the pattern show right through the tile. If you reply and say its only been up a couple days I say wait. If its been a solid week then thats a different issue.